If you don't treat a fountain, whether it's made of stone, concrete, plaster or other materials, with a waterproofing compound, the water will eventually erode the fountain's surface. Masonry waterproofing compounds, which are usually sold as powders that must be mixed with water, are used for waterproofing water-bearing surfaces, including house foundations, swimming pools and fountains. Most manufacturers offer masonry waterproofing compounds in a variety of colors so you can add a bit of flair while protecting your landscape water feature. 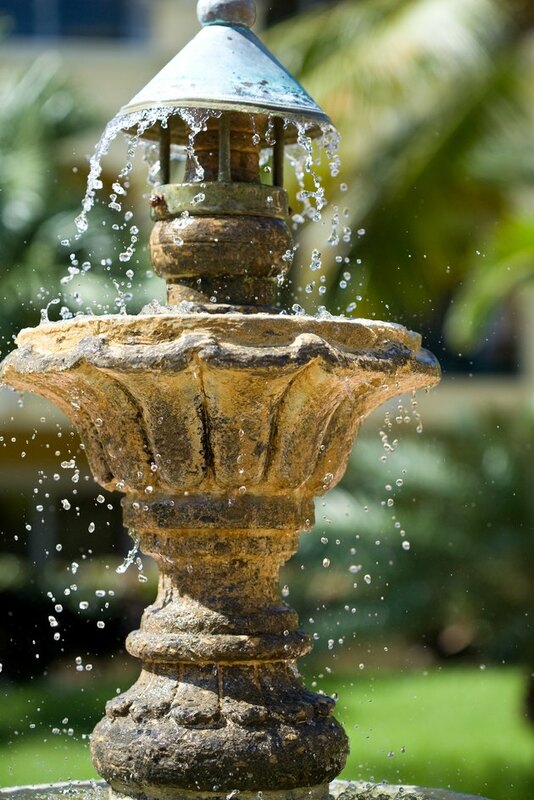 Waterproof your fountain before filling it with water. Drain the fountain and allow it to dry. Scour the dry surface with a scrub brush to loosen up any dirt or other debris. Rinse the fountain thoroughly with water. Mix masonry waterproofing compound as directed by the manufacturer. These directions vary from product to product so read the label carefully before using the compound. Spray the fountain with water if it has dried while you were preparing the compound. Dip a large paintbrush into the mixed compound and spread the compound over the surface of the fountain. Start at the top of the fountain and work your way down. Stir the compound occasionally to prevent the powder from settling. Allow the fountain to dry. Check the progress frequently; once you notice the fountain starting to visibly dry, spritz the surface with a spray bottle filled with water. Repeat this process at least one more time before allowing the compound to cure for six to eight hours. Spray the dried compound with water. Paint a second coat of compound onto the fountain's surface in the same manner used for the first coat, including the curing process. Allow the compound to cure for 24 hours. As it dries, you may notice a powdery residue -- this is simply excess compound and should be rinsed away with water before you fill the fountain. What Paint Do I Use for a Cement Water Fountain?